A few weeks ago we were down in the Village and went in search of the site of the Triangle Shirtwaist Fire. Have you heard of it? On March 25, 1911, it was the location of one of the deadliest industrial disasters in U.S. history. 146 garment workers died in the fire. Until the World Trade Center tragedy 90 years later, it was one of the worst man-made disasters in the history of New York. But it had an impact far beyond New York. The fire resulted in large-scale changes to labor laws which brought many improvements in worker safety. 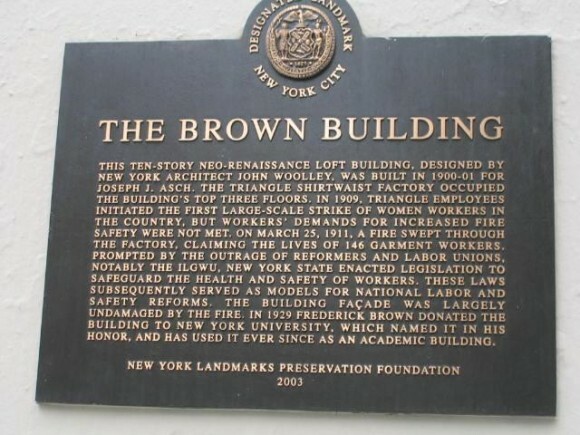 Even now, the anniversary of the Triangle Shirtwaist Fire is commemorated here to remember the garment workers’ lives that were lost and the positive changes that occurred following the fire. As horrible as that massive loss of life was, it pales in comparison to what has happened last year in Bangladesh. First there was the fire in a Bangladesh factory that killed more than 400 workers. This was followed shortly thereafter by the collapse of a different Bangladesh factory. Over 1,100 workers died there. That’s more than 10 times the loss of life at the Triangle Shirtwaist building! There are so many things I want to say about the topic of how fast fashion impacts our world today. More than can be reasonably written (or read!) in a single blog post. But here’s a start. You know how, a few years ago, the Slow Food movement took hold and we realized that we really should know more about what we eat, where it comes from, and how if affects our bodies and our environment? We started shopping for our food locally, asking questions about where our food comes from and how it’s produced. Good, right? Now that same cultural shift is happening with our clothing. 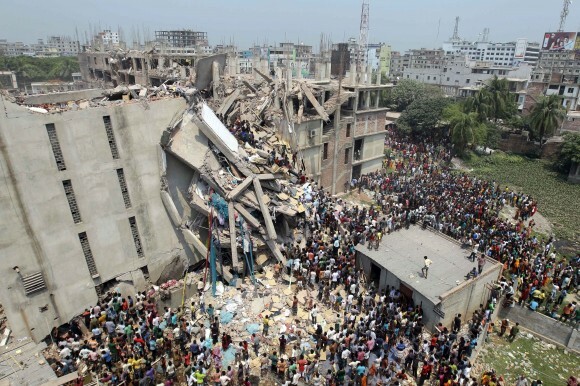 In much the same way as the Triangle Shirtwaist Fire caused big changes in labor laws, the Bangladesh tragedies are causing many of us to re-think our approach to apparel today. Cheap fashion has become such a way of life for us. But what happens to all that cheap clothing when we’re done with it? And what does that cheap clothing do to us, to our surroundings, our society, and our economy? In Overdressed: The Shockingly High Cost of Cheap Fashion, Elizabeth Cline investigates the world of cheap fashion, tracing the growth of the cheap clothing industry, the resulting decline of middle-market and independent retailers, and our obsession with sales and “deals.” She traveled to factories in China and Bangladesh to research the impact of the enormous increase in cheap fashion imports, and she explores how the pressures of cheap fashion have changed garment detail and construction, simplifying the clothes we wear so they are all mostly the same nondescript styles that feature low-quality craftsmanship and poor materials. Many of you who read this blog already know this, or you understand a lot of it. You already make a conscious choice to invest in quality clothing that’s made well and will last, rather than getting sucked into the best “deal” or the latest trend. You recognize that our sartorial choices have a wider impact than just the cost to our wallets. Maybe that’s even why you sew. But cheap clothing still has an appeal, doesn’t it? We are still susceptible to sales and bargains. And most of us own far more clothing than we really need. Worse yet, we discard outrageous amounts of clothing and textiles every year. And the big question is, how do we change this? Are we, as home sewists, doing enough? And what choices are the right choices? I thought I knew a lot about this topic. I mean, I’ve worked in the apparel industry. I know that textile workers are underpaid and often work under hazardous conditions. I listen to the news. I followed the collapse of the Bangladesh factory with absolute horror. I understand the impact on the environment that manufacturing has in third-world countries. And when I buy clothing, I buy quality items that I keep for a really long time and try to avoid cheap, throw-away fashion as much as possible. But then I heard Ms. Cline’s interview on Fresh Air with Terry Gross and realized that there’s so much I didn’t know. So I read the book and learned even more. Far more than I can talk about in a single blog post and still do the topic justice. Listen to the interview on Fresh Air. You also download the podcast in iTunes by following the link. Listen tonight while you’re sewing or washing the dishes. It doesn’t take long. Visit the website. You’ll find lots of great resources, including a shopping guide to help identify designers and manufacturers who abide by ethical, sustainable, and environmental standards. (Natalie Chanin is on that list!) And I especially like the list of Ten Simple Tips For a More Ethical and Sustainable Wardrobe. If you’d like to discuss the book or anything relating to the book, you’re welcome to comment here or drop by our discussion forum to do so! And if you’re ever in New York and want to visit the site of the Triangle Shirtwaist fire, you can find it at 23–29 Washington Place, now known as the Brown Building . There’s a commemorative plaque on the building. For those who are interested in this topic, Kathleen Fasanella has written on it from a manufacturer’s perspective. Check out the links to other articles embedded in the posts and in the comment threads. I made my children watch a excellent doco by the BBC called ‘Blood Sweat & Tshirts’. It followed a group of young Brits traveling around India working in sweat shops. It really opened their eyes to why that dress from Target was so cheap. This sounds like a great book, this topic is close to my heart. I went to her list of 10 tips and she mentions recycling textiles but not how to do it. Does anyone have info? Did I miss a link? Thank you for this! I want to know more about this topic. I am looking forward to listening to that interview. I first heard of this fast fashion issue and “Overdressed,” on the Alabama Chanin blog. It made a bit of an impact on me, to the point where I have sailed by the cute, cheap dresses for my girls at Target (which is hard, because sometimes Target really nails it, and unfortunately, my kids can trash clothes) and have been holding back buying stuff for myself. I have checked out Elizabeth Cline’s blog, and even though she has that great list, it overwhelmed me because the clothes I tend to buy weren’t listed. And I love the idea of better quality – I hate sweaters that pill and all the synthetic fabric being used – I do love having a lot of choice in my closet. I really want to spend more time researching this, especially since I don’t know if my Madewell tee is produced in an ethical way. Or the Boden I buy for the girls. And it goes deeper than just construction. Where is the cotton grown and how? Transportation costs. And what happens to the people when I stop buying cheaply made garments. Then they’ll have no income if the factory closes. I do sew some from the girls and wonder about fabric. If I buy fabric from Joann’s (really, my only brick and mortar fabric store within 60 miles) is it produced the same “fast” way? I am not even sure how to check. It isn’t printed on the selvedge – not on the fabric I just looked at anyway. I have found some organic fabric, but it is expensive, and I don’t sew as well as you, Liesl, so it makes me nervous…..
@betz….Donate to thrift and salvage stores, check with local Boy Scout troops and animal shelters as they often have yard sales to benefit their organization. Also, your area women’s center or orphanage. You can even have your own yard sale. Also, check swapping sites on Facebook. There are usually many swip swap sites in most cities/areas. As a sewist for my daughter, and eventually for me and others in the family, the struggle to find cloth that is ethically made is huge. The loss of textile mills in the Carolinas is a big issue. Where do we find homegrown cotton, spun, woven, and printed here? I’ve been on a personal RTW fast since the beginning of this year, although I didn’t read Overdressed until a few months ago. I still buy cheap clothes for my kids (3, 3, and 5) because they are hard on clothes and grow so fast that it doesn’t make sense to spend $30 on a pair of pants for them. Even if the twins can share clothing, it still lasts only a season (6 mo at the most). I know this can seem really overwhelming, but baby steps are ok for starting out, too. I think Elizabeth made an excellent point when she was talking to Terry Gross on Fresh Air: even if we just consume less (meaning buy less and buy it less frequently) we’re helping to alleviate the tremendous amount of clothing that gets destroyed every year. If we buy quality fabric, buy quality clothing and KEEP it (and wear it) for longer, that’s already helping. If we focus on consuming LESS, we’re doing something. Also, while we can’t visit every factory and see where all our clothing is coming from, we CAN let our government representatives and the stores where we shop know that this is an important issue for us. We can ask questions and educate ourselves as much as possible, and we can try to buy from stores that we know are treating their employees ethically. We can’t solve the problem individually, but by each playing a roll we can each be part of a larger movement. That’s what excites me about this issue: just knowing that the problem exists, we can make choices that will at least help, even if we aren’t solving the problem ourselves. We can be part of a larger movement that puts pressure where the changes need to be made. As consumers, we’re the biggest part of the problem because we’re BUYING it. If we stop buying it, it won’t be produced any more. And if we demand ethical treatment of the folks making our consumables, they’ll ultimately be treated fairly. The customer gets what the customer demands. So far, we’ve just been demanding cheap, cheap, cheap. Once we stop and start demanding something else, that’s what we’ll get! I suspect that if we would all just write a letter or email to our top two favorite stores and tell them we’re concerned about this issue, they’d be forced to listen and respond. What do you think? I’d love to hear more of your thoughts about this. Please keep the conversation going! Before I read this book I felt strongly about all the clothing junk I see in stores now. After reading it I am determined to not be part of the problem. I get so concerned about wanting change to happen quickly but I need remember changing my behavior and attitude is the most important thing to do. Instead of buying my little Granddaughter’s clothing from mall stores for a few bucks I can buy great patterns and fabric from American designers. And also pass on sewing skills to her when she is older. I am of an age that I remember we had fewer clothes and very small closets compared to today’s homes. I will remain hopeful that this awareness will grow into new attitudes and behaviors! I am concerned about this and the food issue as well. But I feel like an island sometimes. Everyone around me is hustling to the next event. Dropping money left and right at Target and big warehouse grocery stores just in pursuit of the next soccer game and practice and vacation here and there. It is so easy to be swept along with them. There is very little time for sewing or cooking, and if I just stop buying then we just don’t have anything to wear or eat. I have fabric and flour and eggs but no time to make anything with it. I know you know. Out there. You get it and I am grateful to hear that you all care too. And maybe we can change it. Someday. Anyway, I love your thought that our culture might view fashion like we are starting to view food. It seems that our little sewing/handmade community is growing, so I have hope! I do wonder about the fabrics we buy. So many of them are woven in other countries. What are the conditions where they are woven? I do shop more for fabric than ready made clothes but I have to have the same conversations with myself when I’m tempted to buy fabric just because it’s beautiful and “maybe someday I’ll find something to use it for”. One just needs to be mindful of over consumption. A great post! Great post! I also heard the Fresh Air interview a few months ago and got a copy of the book from the library and finished reading it a couple weeks ago. I wish EVERYONE could read this book. I’ve looked again at my donate pile to see what I can salvage for my own use. I had a pair of pants that had an annoying slit in the bottom so they flapped open a bit every time I walked. I didn’t even consider sewing it up until I read her book. MAKE-ALTER-MEND! I sewed up the pant legs and I’ve ended my search for a new pair of white pants. I don’t think very many people ever think to use a tailor to make their clothes fit them perfectly. If only everyone thought to do so. Not only would we consume less clothing, but we would be employing talented people locally. I’ve also hacked off pants and made them shorts for my son. He wore the pants during fall/winter and they had enormous holes in the knees. I didn’t really know what to do with them – couldn’t donate them, couldn’t throw them, but now he’s got 4 new pairs of shorts to wear. We are in such a culture to just get rid of everything instead of trying to fix or alter. The environmental impacts of all this is enough to make me sick to my stomach. I’m just assuming that Chinese factories aren’t recycling their water or really even using very clean water to begin with. It just continues to trickle down in to so many different factors. I wish people would educate themselves better and realize how they are contributing to the problem and start working to change it. Even doing a little bit would make such a difference. I could go on and on, but thanks for the great post and bringing awareness to this issue!!! Thanks for this post. I’m kind of afraid to read this book, just like I avoided Fast Food Nation for years. I’m letting it trickle into my consciousness through people like you who have read it and written about it, and made choices to buy secondhand clothing and refashion and sew my own, to support companies like Near Sea Naturals that focus on selling fabric that is organic, sustainable and often made in the US, and to focus on quality over quantity. It’s another of those problems I care about, but have to be careful not to let the scope of it overwhelm me into non-action. Fabulous post Liesl. As the mama of a daughter of China, my whole view of fast clothing changed 8 years ago when we travelled to adopt her. I had always sewn but also loved a bargain. Once we brought her home, I could no longer justify purchasing garments that may possibly be sewn by underpaid, unprotected and undervalued workers. But for the grace of God, my little one would possibly someday be that undervalued worker. That is when we seriously took a look at our consumption of products. The positive thing is that I taught myself to smock because I didn’t feel good about purchasing underpriced smocked things. I sew nearly everything my youngest daughter wears, and much of what I and my older daughter wears. For my husband, we just try to purchase more intentionally. The funny thing in all of this, is that my now 8 year old daughter of China is obsessed with sewing! I swear I am not breaking child labor laws!!! But she loves to sew and begged for her own machine when she was 5. Today she made her own denim capri pants and intends to wear them for the first day of school. 🙂 She wanted to make a blouse too but I am making her wait until tomorrow so I can get some sewing done myself. But it has been a learning experience for our family. I think the recession revived, for younger people struggling for work, the idea of ‘make do and mend.’ Since I started sewing just a few years ago I have been looking at clothing at stores with an extremely critical eye toward construction (in addition to fabric quality and fit, which I already scrutinized). Just because of that, I’ve been buying less for myself. To people like me in podunk towns with only Joanns to shop at, I recommend looking at the sticker on the cardboard bolt for country of origin. There’s no way to tell if the particular factory in question is sustainable or awful but you can pick and choose what country you prefer. One’s choices are limited in terms of color and very much in terms of print, but there are American and European fabrics available. And look at it this way. Fabric factories can hardly pay the employees “by the piece” like the pre-union slavish places paying pennies per tshirt or whatever. So buying fabric from anywhere and making up your own piece will always be more ethical in that regard. This is a great post, Liesl. I’ve tried to explain to friends why I choose to sew my kids’ clothes even when I don’t feel like it. I think the comparison with food is right on. I will use that example next time. I hate to buy what I call “disposable clothes”. I do buy the kids’ polos for schoo, socks, and shoesl, but that’s about it for them. The rest I make myself. I agree with you when you say that even just buying less is doing something to help. I buy RTW for myself, but usually the items are used and then I wear them until they are literally falling apart. I splurged a couple weeks ago and bought myself some new RTW summer clothes. I only bought a small number of items and I know that I will wear them for many years, so at least I’m not buying much. When my clothes wear out, I save the buttons and cut up the fabric for my husband to use in the garage as work rags, so at least they don’t just go in the trash. Who knows? Maybe I’ll start sewing my own clothes by the time my latest purchases wear out! WOW – Just reading the 10 tips referenced above. 68 garments & 7 pair of shoes per year? I must be an odd person, because I’ve purchased only 10 garments in the past year and I typically buy 1 pair of shoes every 2-3 years. I know I’m late to the discussion, but I find myself so torn on this issue. Have you read humanitarian and Half the Sky author Nicolas Kristof’s piece entitled ‘Where Sweatshops are a Dream”? http://www.nytimes.com/2009/01/15/opinion/15kristof.html It seems to be more nuanced than just ‘boycott sweatshops’. I also own The Better World Shopping Guide (http://www.amazon.com/The-Better-World-Shopping-Guide/dp/0865717249) and while I cannot attest to how accurate their findings are (my husband is skeptical), I can say that what surprised me most was that some of the cheaper clothing manufacturers got good ratings whereas some of the more expensive stores scored poorly. For instance, GAP (which includes Banana Republic and Old Navy) got a B rating. Ralph Lauren got an F rating. DKNY got a D-. 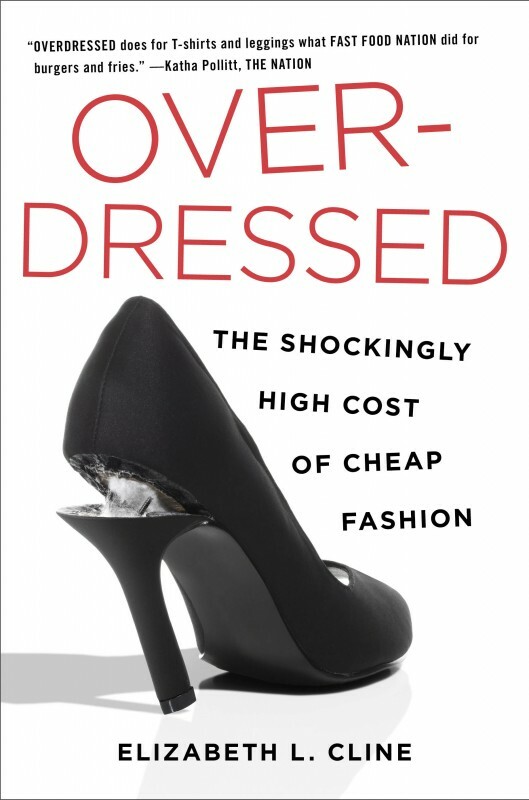 So, at least according to this book, the cost of clothing does not necessarily correlate with the quality of the shops in which the clothing was made. Thanks so much for posting this! I had just finished my first dress for myself (I have been sewing O+S for my kids for a few years) when I read this book. I love that I actually have the ability to make my own clothes to my measurements and quality specifications! As some other’s mentioned, I have started worrying about where my fabric is coming from in the last few years. I have seen several organic brands/lines coming out recently so hopefully there is more of that to follow. I loved the part of the book about the Knight company (college t-shirt company) and how they created a great factory with good working conditions and paid a LIVING wage instead of MINIMUM wage. The labor is so ridiculously cheap in most of these countries already that it is amazing that they have to haggle over paying them even just a little more. Since I began sewing I have been completely amazed that some garments can be sold so cheaply when a cute $10 girls’ skirt at target would take me over 5 hours to complete? It is hard to compete. This book offers reasons (beyond money) to think over our purchasing choices.